Students involved in Middletowns Green Street Arts Center After School Program look up to Wesleyan Universitys basketball team in more ways than one. 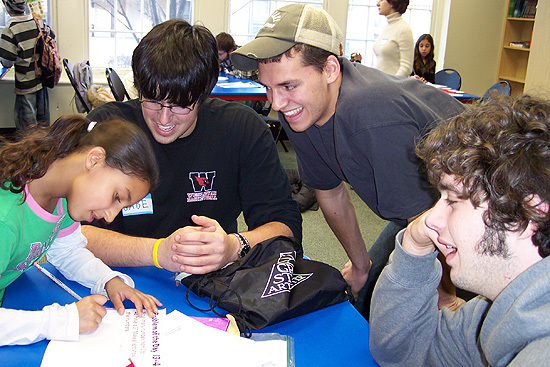 They always tell me that Im so tall! exclaims Gabe Gonzalez-Kreisberg, a 6-ft. 8-inch tall Wesleyan freshman, recalling how students he helps tutor at the center, like 7-year-old J.J., describe him. Gonzalez-Kreisberg recently helped launch an ongoing tutoring volunteer initiative at Green Street Arts Center with Wesleyan Universitys basketball players. The idea first occurred to Gonzalez-Kreisberg after Wesleyan basketball coach Gerry McDowell encouraged his team to volunteer in the Middletown area during their winter break from classes. Gonzalez-Kreisberg remembered an e-mail he received from Wesleyans community service office calling for tutors at Green Streets After School Program. He then mentioned the program to Coach McDowell and the entire team immediately agreed to help. As a result, in shifts of four players per day, the basketball team began to regularly tutor Middletown children enrolled in the program. Even now, with spring semester underway, a handful of players continue to tutor in their free time. When they arrive at the Green Street Arts Center, the students, who range in age from seven to 14, eat a snack and socialize a bit with friends. Then the students who are not enrolled in arts classes go to the homework room where several tutors, including the basketball players, are stationed to assist them. After helping students finish their homework, which can be in a variety of subjects including math and reading, the players often talk with the kids and sometimes play board games with them. Ashe, who has always enjoyed tutoring his peers even back in high school, says the board games help to motivate the students to follow through and finish up their homework. Thirteen year-old Elijah always wants to finish his homework, he says, because that means Gonzalez-Kreisberg will tell him a story afterwards. One time, Gabe told me how he touched the court at an Orlando Magic game! shouts Elijah. During every tutoring session, Wesleyans basketball players agree that the students always seem to get excited about their schoolwork. I think one reason why is that were such a close group of guys that are all genuinely happy to help out, says Ashe. Gonzalez-Kreisberg says another reason why is because he and his teammates act as mentors for the students. Because we play a sport and because these students are impressed by the NBA, it allows us to connect directly to them, says Gonzalez-Kreisberg. We try to always stress to them that we are just people who happen to play basketball and that were strong in our academics first, then in athletics, he says. Despite heavy academic and athletic schedules, both Ashe and Gonzalez-Kreisberg, and other players, like sophomore Nick Pelletier from Amherst, New Hampshire, are committed to continue tutoring at Green Street. Even Coach McDowell has committed to spend some time tutoring at the Center before the year is out. For more information about how to become a Green Street Arts Center volunteer, please contact volunteer coordinator Lauren Tinkoff at ltinkoff@wesleyan.edu or visit www.greenstreetartscenter.org.